Two Marine veterans of the 1991 Middle East conflict share why they honor President George H. W. Bush. They praised his leadership of a ground war that lasted only 100 hours. 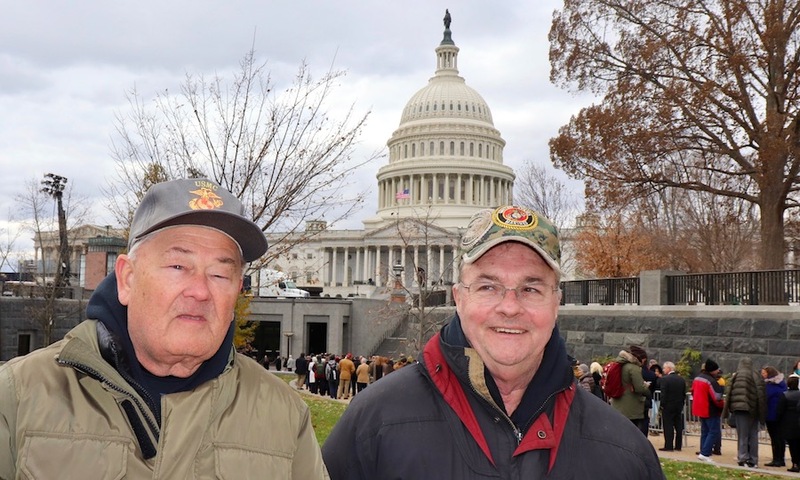 On Tuesday, December 4, U.S. Marine Corps veterans Lou Hearrell (left) and T. J. Pittman wait to enter the U.S. Capitol. Thousands paid their respects to the late President George H. W. Bush who laid in state starting Monday evening. This week, the world mourns the loss of George H. W. Bush whose four-year term as President began in 1989. He also served as a Texas Congressman, U.S. ambassador, CIA director and Vice President for eight years under President Ronald Reagan. These positions followed his years as a Navy pilot in the 1940’s. Bush was the last of nine U.S. Presidents directly involved in World War II. He died on December 1 at age 94 in his Houston, Tex. home. It was nearly eight months after the passing of Barbara, his wife of 73 years. In Houston, his casket was placed on the same pine wood catafalque that carried the coffin of President Abraham Lincoln in 1865 — and every deceased U.S. President since. Air Force One transported the former President from Houston to Joint Base Andrews near Washington, D.C. As the black hearse drove past, many waved flags or stood silently to honor his life. In a Monday night ceremony at the Capitol, Vice President Mike Pence eulogized the elder Bush. Those in attendance to honor the patriarch included former President George W. Bush, former First Lady Laura Bush, former Florida Governor Jeb Bush and other family members. Following the ceremony, the Capitol was opened for all to pay their respects. 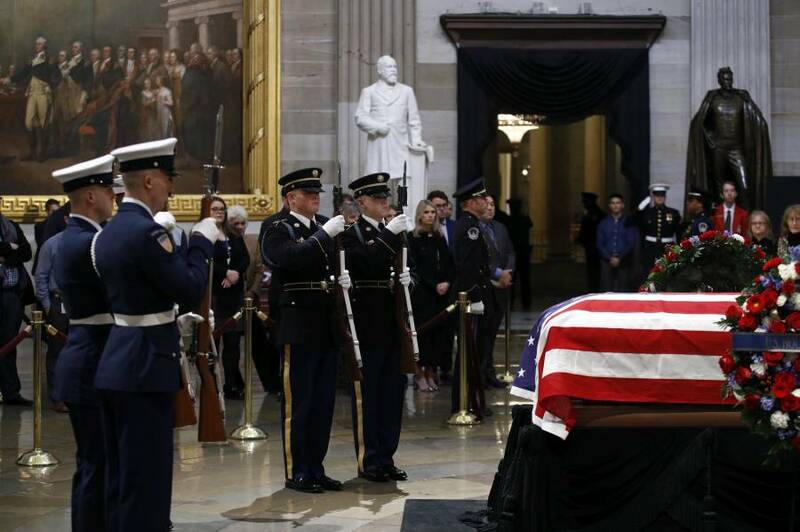 During the 36 hours President George H. W. Bush lie in state, more than 42,000 people streamed through the Capitol Rotunda. Some braved overnight temperatures that dropped to 35 degrees as they waited in line. Among them were T. J. Pittman and Lou Hearrell, two Marine veterans of the Persian Gulf Walf in 1991. After watching Pence’s speech the night before, the two decided to drive together 50 miles north from Fredericksburg, Va. to honor their commander-in-chief. In the conflict known as “Operation Desert Storm,” Bush led a 30-nation coalition that drove invading Iraqi forces out of Kuwait. The ground war lasted only 100 hours, and the entire combat operation ended after 42 days. Coalition forces lost 292 troops, while more than 25,000 Iraqi combatants were killed. Desert Storm was the first conflict to use laser-guided bombs and other high-tech stealth strategies to wage war. “I think the technology used in that war saved lives, and it’s doing so to this very day,” said Hearrell, whose 50 years of public service include 27 years in the Marines. 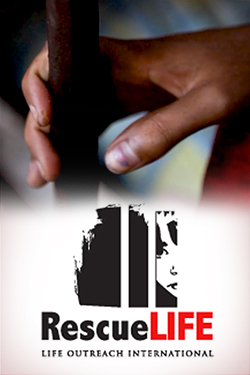 “Everybody I served with was there to get rid of the insurgency,” he continued. The former ammunition technician was stationed at the Marine Corps staging area in Al Jubail, Saudi Arabia during the Gulf War. The veterans know firsthand that many Americans fail to understand the sacrifices of military service members and their families. Nationwide, only seven percent of the population has served in the U.S. Armed Forces. In invading Kuwait, Iraqi President Saddam Hussein defied neighboring Arab nations and several United Nations resolutions. Because Gulf War-era coalition efforts to assassinate Hussein failed, some consider the conflict an unfinished one. Not until 2003 would a different U.S.-led coalition force successfully capture the genocidal Iraqi leader, who was hanged in 2006 after his trial in Iraq. Many foreign policy experts have praised the elder President Bush’s restraint in the conflict, led by an effective multi-national coalition with a defined mission. The former Marine Corps recruiter who served on the front lines in Iraq did not dwell on their service. He commemorated the men and women the late President Bush regarded as heroes. Watch the video below to learn more about the Persian Gulf War. Explore The Stream’s complete coverage honoring the late President George H. W. Bush.